Forest and peatland fires regularly spread across Sumatra and Kalimantan, destroying ecosystems, threatening human health, contributing to biodiversity loss, and accounting for the largest source of greenhouse gas emissions in Indonesia. To prevent these detrimental outbreaks of land and forest fires, early warning instruments must be used to anticipate when and where an outbreak will occur. Responding specific need for fire early detection, CCROM SEAP and the Earth Institute at Columbia University, the United Nations Office for REDD+ Coordination (UNORCID) and the UN office for Project Services (UNOPS) have developed an anticipatory Fire Risk System (FRS) to provide government agencies with information based on climate forecasts and fire vulnerability analysis at the provincial and district level. This early warning information is to serve government agencies in initiating critical preparatory action to mitigate fires. 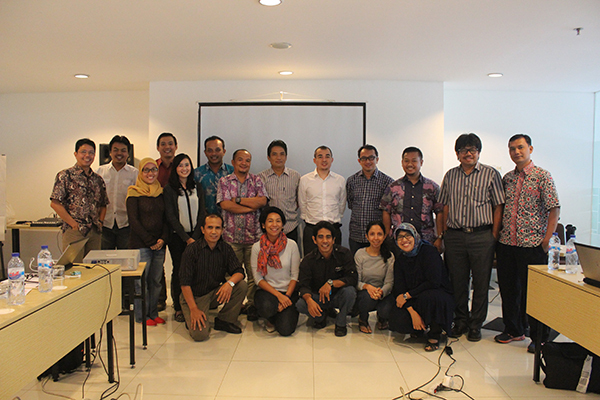 In line with this, CCROM with Columbia University, UNORCID and UNOPS organized three days training on the GAMBUT project and on the use of the Fire Risk System (FRS) targeted for the project team members and relevant partners on 12 – 14 April 2016 in Bogor. The objective of this training was to provide the overview of the project, technical discussion on how to use the FRS, and overview on how the system can be effectively mainstreamed at the national and subnational level. By the end of the training, the participants were expected to have thorough understanding of the upcoming implementation activities and the usage of FRS, as well as GAMBUT operational related issues.